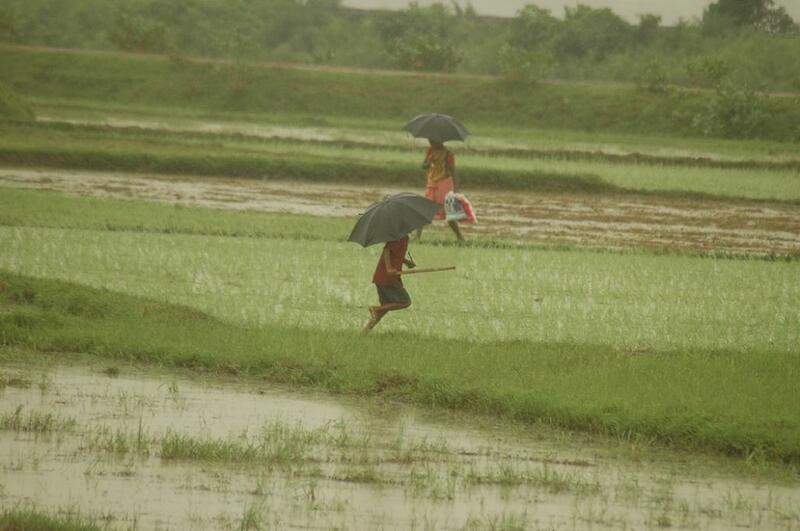 The Indian summer monsoon, which brings rainfall each year between June and September, has strengthened in the last 15 years over north central India, revealed a new study by the researchers at the Massachusetts Institute of Technology (MIT). According to the study published in Nature, a 50-year drying period, during which the monsoon season brought relatively less rainfall in northern and central India, has been reversed. The drying phase gave way to stronger monsoons and damaging floods in the densely populated north central region of the country. Last year, a Down To Earth report highlighted increasing amount of evidence pointing towards an increase in the number of heavy rainfall events. The researchers attribute this to a shift in India's land and sea temperatures. Beginning in 2002, nearly entire country has experienced very strong warming, reaching between 0.1 and 1 degree Celsius per year. Meanwhile, a rise in temperatures over the Indian Ocean has slowed significantly. According to Chien Wang, a senior research scientist in MIT's Department of Earth, Atmospheric and Planetary Sciences, high temperature over land and low temperature over surrounding waters has triggered stronger monsoons. "India went through a sudden, drastic warming, while the Indian Ocean, which used to be warm, all of a sudden slowed its warming. This may have been from a combination of natural variability and anthropogenic influences," says Wang. By studying yearly measurements of rainfall, Wang and Qinjian Jin—co-author of the study and a postdoctoral scholar in the Joint Program for the Science and Policy of Global Change—found that India has already begun to reverse its dry spell. On tracking India's average daily monsoon rainfall from 1950 till the present day, using six global precipitation datasets, they found that north central India experienced a decrease in daily rainfall average in monsoon season by 0.18 millimeters per decade. However, they also discovered that since 2002, precipitation in the region has revived, increasing daily rainfall average by 1.34 millimeters per decade. Summer monsoon in India is initiated by unequal heating of the Indian subcontinent and the Indian Ocean in the pre-monsoon season (May and June). Therefore, the quantity of monsoonal precipitation is correlated with the land–ocean temperature gradient. 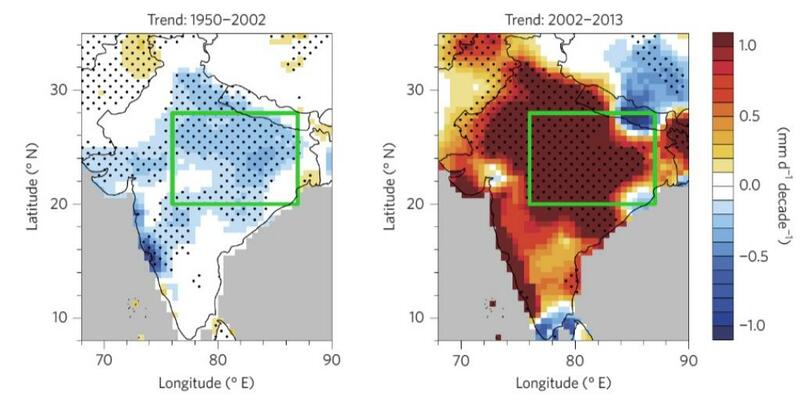 Before 2002, the pre-monsoon surface air temperature over the Indian subcontinent showed a moderate but statistically significant cooling trend of 0.04°C every decade. Since 2002, the same region witnessed a rapid warming trend of 0.37°C each decade. Similarly, the pre-monsoon sea surface temperature, which was rapidly warming throughout between 1950 and 2002, experienced a slower warming in 2002–2014 (0.08°C each decade as opposed to 0.13°C). The researchers observed a brief drying period during the 2015 monsoon season that caused widespread droughts throughout the subcontinent. They attribute this break in the trend to a severe El Niño season, where ocean temperatures increased temporarily, causing a shift in atmospheric circulation, leading to decreased rainfall in India and elsewhere. "But even counting that dry year, the long-term [wetting] trend is still pretty steady," Wang says. While the El Niño phase could only slightly change the magnitude of rainfall, it could not arrest the revival of the monsoon rain. What is causing land to heat up while oceans cool down? The researchers have made some guesses apart from pointing to land-use and land-cover change. According to Wang, ocean cooling could be a result of the natural ebb and flow of long-term sea temperatures. The warming on land surface, on the other hand, could be due to reduced cloud cover, especially at low altitudes. Clouds reflect incoming sunlight, thus, preventing rapid heating of land surface. However, in recent years, India has experienced a reduction in low clouds, perhaps due to an increase in anthropogenic aerosols like black carbon or soot, which can absorb more sunlight. When the aerosols absorb more sunlight, they are more effective at preventing clouds from forming. "But these aerosols have been around even during the drying period, so there must be something else at work," says Wang. "This raises a lot more questions than answers, and that's why we're so excited to figure this out." The study concluded that the revival of monsoonal precipitation is not just an inter-decadal variation and will last for multiple years.